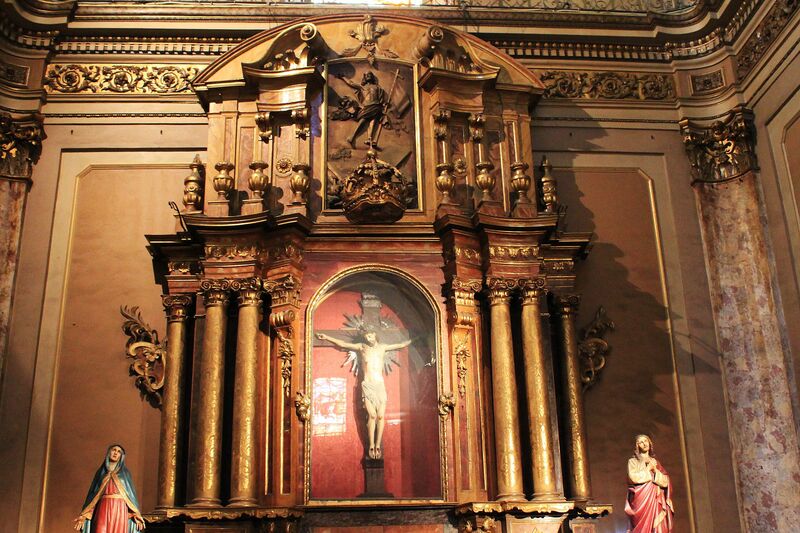 Buenos Aires Metropolitan Cathedral presents history, facts, church interior design with its altarpieces, chapels, statues, paintings, frescoes and San Martin’s mausoleum. 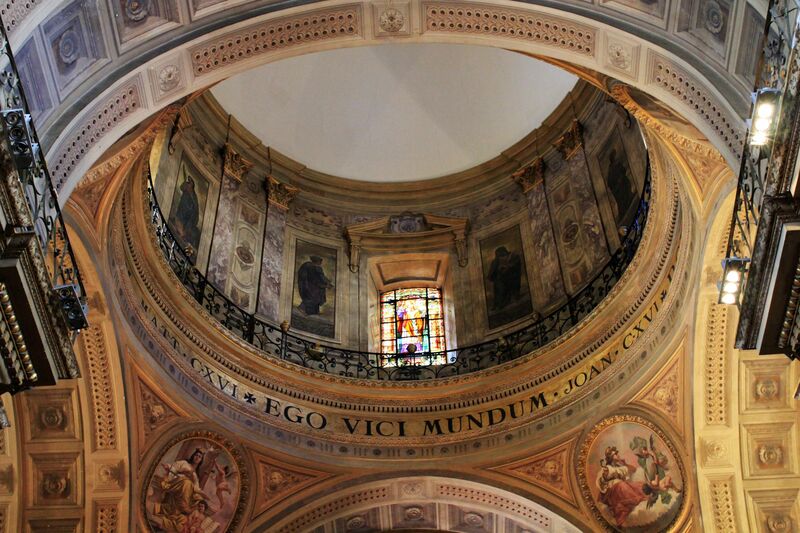 The history of Buenos Aires’ Metropolitan Cathedral is almost as old as Buenos Aires itself. The first wooden church in Ciudad de Nuestra Señora Santa María del Buen Ayre (as originally the place was named) was erected in 1580 by an order of Juan de Garay – (the first ruler of the settlement). Due to its poor construction and low quality materials the first church lasted only 25 years. It started however the long succession of future churches being built and then successively being pulled down to make place for new more beautiful and longer lasting structures. In 1621 Rome and Madrid in a joint effort established the first diocese in Buenos Aires with a Carmelite Bishop Pedro Carranza in charge. The new church that has been built to serve as a cathedral soon after shared the destiny of its “predecessors”. By the mid 18th century consecutively five Buenos Aires cathedrals were built – all having short life-spans as they either collapsed or were demolished for the safety reasons. Interesting enough – together with the current Cathedral they shared the same location in Barrio San Nicolas (today the corner of San Martín and Rivadavia streets overlooking Plaza de Mayo). The construction of the present Cathedral (6th one in the history of Buenos Aires) started in 1752. This time the availability of substantial funds was a guarantee of much more ambitious and longer lasting success. The design was commissioned to an Italian architect Antonio Masella. He proposed a magnificent three-aisled nave structure with the footprint of a Latin Cross and 6 lateral chapels covered by barrel vaults and an imposing dome. The construction process was not free of failures. During the time some parts of the new cathedral has been demolished due to construction mistakes, cracks or simply because they did not adhere to the general concept of the temple that “crystallized” much later. The inauguration of the Cathedral took place in 1798 followed by the consecration in 1804 in the presence of Benito de Lué y Riega - a last Bishop of Buenos Aires under colonial rules of Spain. The final major step in the long construction process occurred in 1820’s when the French architects Próspero Catelin and Pierre Benoit were charged with the task of adding the frontal facade. 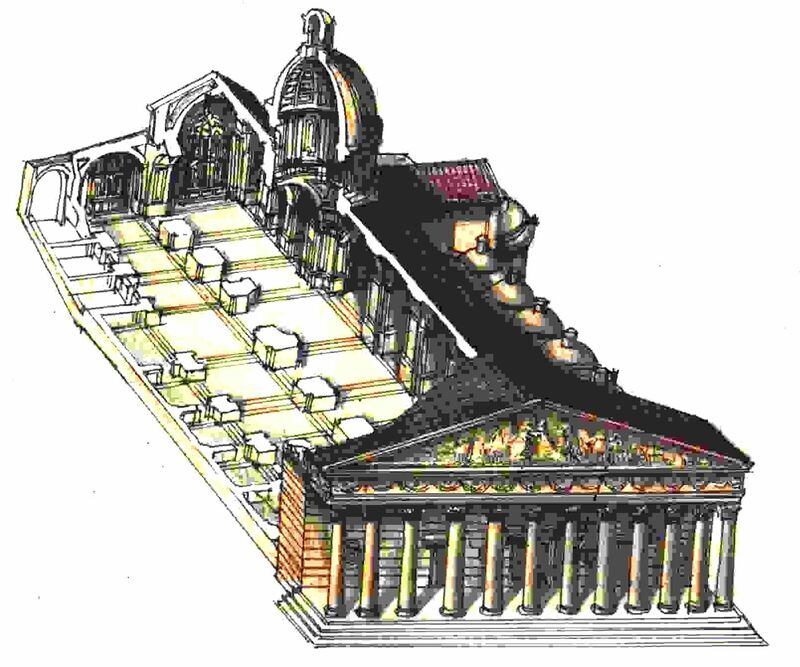 Consisting of 12 Corinthian-style columns symbolizing 12 Apostles, the Neo-Classical colonnade made a huge impact on the silhouette of the Cathedral making it looking like an ancient Greek Temple rather than a Catholic Church. The towers – seemingly an architectonic “must” in Catholic religious structures at those times were previously taken apart. The triangular tympanum above the colonnade holds the carvings by the French sculptor Joseph Dubourdieu. It presents the biblical scene of reunion of Joseph with his father Jacob and brothers in Egypt. Apparently this allegoric scene is a reminiscence of the newly achieved unity of the Argentinean nation after long years of civil wars. For the celebration of hundred years anniversary, the Cathedral underwent significant “beautifying” works. The originally bare walls and ceilings were decorated with frescoes by an Italian painter Francisco Paolo Parisi. The most important part of the decoration from that time among others includes: - symbols of four cardinal virtues - Prudence, Justice, Fortitude and Temperance (Moderation) – all displayed above the columns holding the cupola. - two biblical scenes, one of Jesus with Samaritan Woman and the second one presenting Jesus with Fallen (Adulterous) Woman, both decorating the ceiling above the Chancel (Choir). In 1907 the cathedral’s floor received Venetian-style mosaics designed by an Italian Carlos Morra. Some say that the beautiful motifs of Pasionarias (Passion Flower) are in reference to the Passion of Jesus. Whatever was the thought behind this ornamentation, certainly it reflects the fact that these beautiful flowers in a spectrum of colors from “blue sky” to purple are common in the area of Buenos Aires. Despite the long construction process and several renovations, the cathedral still holds many masterpieces remembering old colonial times. The most important is the Rococo-style main altarpiece designed by Spanish sculptor Isidro Lorea in 1785. It holds the statue of Virgin Mary in the center. 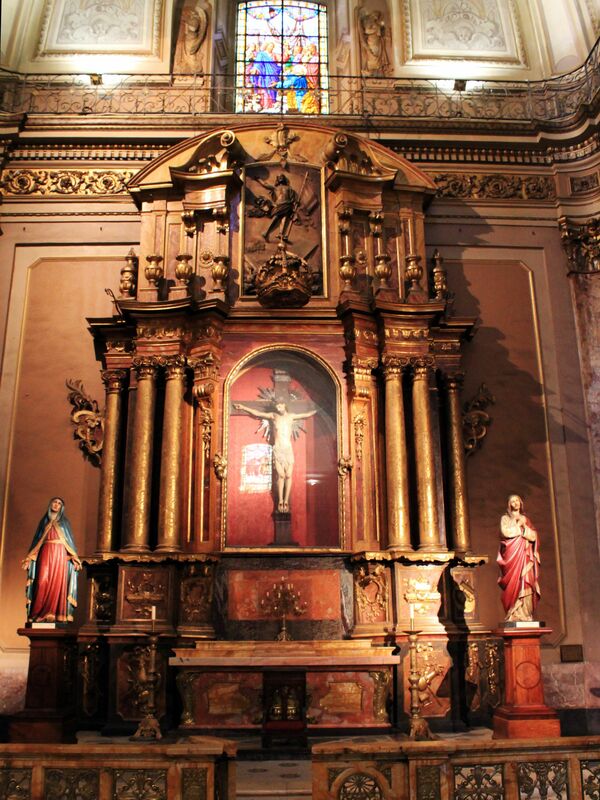 On the left lateral part of the transept in the center of the altarpiece there is a sculpture of the crucified Jesus. The statue carved by Portuguese sculptor Manoel da Coyto in 1671 is called the Christ of Buenos Aires because according to faithful, it miraculously saved Buenos Aires from the flood in the 18th century. This oldest statue on the cathedral is carved from the algorrobo blanco (white carob) tree. The two pulpits symmetrically located on both sides of the main nave (quite unusual in Catholic churches) were made by the Spanish sculptor Juan Antonio Hernández in 1789-1790. Worth of attention (from the artistic point of view) are also fourteen paintings depicting Calvarium (called also Via Crucis in the Christian tradition). This is the original work (“oil on canvas”) by Italian painter Francesco Domenighini. Pulpits made by the Spanish sculptor Juan Antonio Hernández in 1789-1790. Right - Capilla del Sagrado Corazón y Santa Margarita M. de Alacoque (Holiest Heart and St. Margaret de Alacoque's Chapel) with Imagen de Nuestra Señora de Itati (Statue of Our Lady of Itati). 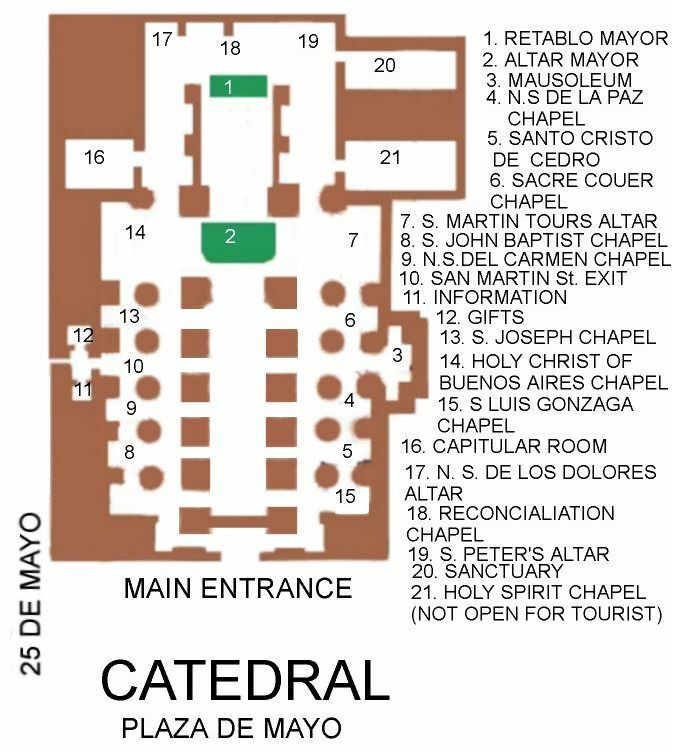 4th - Altar de San Martin deTours (Altar of St. Martin of Tours). You may agree that the consecutive 6th Metropolitan Cathedral in Buenos Aires is not only imposing due to its dimensions, intriguing thanks to its external architecture, but it has also a beautifully finished interior. Faithful – may feel here like in a truly Holy Place with centuries old mysteries of Christian Faith. 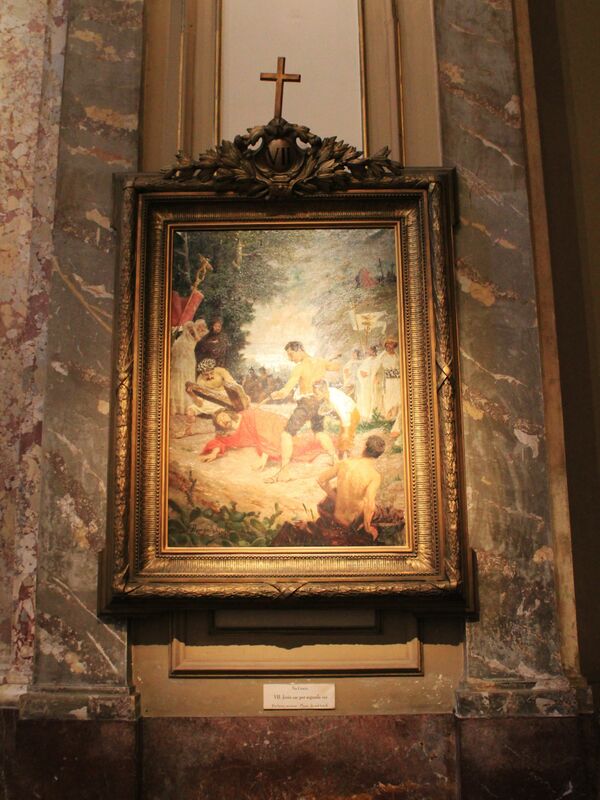 They will find sacred statues and altarpieces regarded with religious veneration, worship, and respect…. But those that come here only to appreciate the fine art will not be disappointed. And finally those open for the historical facts will also find something to quench their thirst – The Mausoleum of General San Martin and his closest commanders.